Accumulators may also be known as a pressure storage reservoir or energy storage device. Accumulators are used to store a volume of fluid under pressure and release it when the pressure is removed e.g. they provide additional fluid flow when the system pumps are not large enough to provide maximum flow required, generally over a short period of time. As a fluid reservoir, accumulators are used to provide additional flow when the pump cannot achieve the highest flow rates required. This situation is quite common because if a machine only needs say 60 L/min for 4 seconds then it's a lot cheaper to use a 10L/min pump with an accumulator than a 60L/min pump without. Over 4 seconds the total volume of fluid required is only 4 litres. If the machine only moves once every minute then it's quite possible the 10L/min pump and its much smaller electric motor, working with a 20L accumulator, can provide the full 4 L at a rate of 60L/min. For dynamic response, accumulators are used when the system needs or receives very large, instantaneous peaks of flow over very short time periods. This may be to supply the flow to a fast responding valve or damp out pressure peaks in the tank return line from a mechanical shock onto the system, for example. As an emergency power source, accumulators can supply pressure to a brake system, for example, if the power source fails or to avoid issues as the pump is shut down. As a standby flow, accumulators are used to compensate for small leakages and maintain pressure on a system for long periods, while the power unit is turned off. As a noise and vibration attenuator, accumulators are used to damp out pressure ripples or peak amplitudes and allow systems to run more smoothly or quietly. As a closed system compensator, accumulators are used to balance out volume changes caused by a change in temperature etc. For general purposes, hydraulic fluid is considered incompressible. This makes it excellent for transmitting power efficiently and driving cylinders and motors wherever they might be located. It also means that the hydraulic fluid cannot be used to store energy. Gasses, such as Nitrogen are compressible. This means they can be compressed by a load, and once the load is removed they will expand back to their original volume. This property means that they can be used to store energy for long periods without any leakage or operating energy loss. Accumulators are pressure storage vessels and as such must comply with the Pressure Equipment Directive (PED) or the relevant legislation in other countries. This may require periodic testing or replacement of the pressure vessel after a certain number of years, depending on the application and the relevant local legislation. As an energy storage device accumulators bring additional risks because even if the power unit is turned off, the accumulator can still provide enough power to cause injury if the system is operated or stripped for maintenance. Even when fully drained and vented of fluid the accumulator is likely to still contain high-pressure nitrogen which can be dangerous if it's not released safely or could cause an explosion if heated by a fire etc. 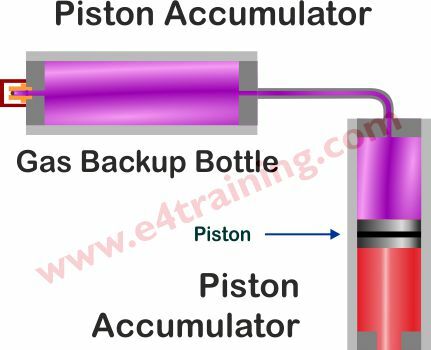 There are three main types of hydraulic accumulator. 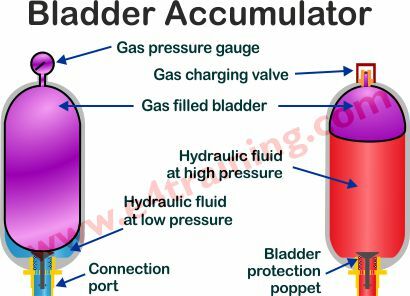 Bladder accumulators use a flexible balloon to retain the nitrogen gas and keep it separate from the hydraulic fluid. The poppet valve, fitted in the fluid port of the accumulator, is designed to protect the bladder from the sharp edges of the port when it is fully expanded and direct the high flows around the bladder during fast volume changes. Bladder accumulators are typically rated to around 345 bar, have very dynamic response times but are mainly used in industrial application due to the risk of damage to the bladder, which can fail catastrophically, but can also be changed relatively easily. Piston accumulators come in the largest range of volume options. Dynamic performance is not as fast as a membrane accumulator due the weight of the piston and its dynamic seal. Seal friction also brings hysteresis and duty cycle limitations, although the piston and seal remove the risk of catastrophic bladder failure but will fail with a gradually increasing leak instead. Accumulators are typically rated to around 345 bar and used in both mobile and industrial applications. Piston accumulators can also operate with higher compression ratios up to 10:1, and are better at withstanding pressure peaks than membrane designs. Diaphragm accumulators provide good dynamic performance but are only available in a small size range and the membrane cannot be replaced if it fails. Pressures are typically limited to around 250 bar but they can be used in mobile or industrial applications. Mechanical and spring accumulators are not sold as standard devices but can potentially be constructed using a mass or spring on a cylinder. We will not cover them in this section but if they are used as a pressure vessel they will need to comply with the relevant pressure vessel legislation e.g. PED. Energy storage accumulators always require a safety block to be fitted complete with a certified relief valve. Dynamic accumulators may not need a safety block if they are always open and free to drain down to atmospheric pressure when the system is turned off.